Oh boy. My daughter really wanted me to read this book after her fourth-grade class read it at school. She liked it so much we got the follow-up book (not a sequel) as one of the audiobooks we took on an Easter weekend trip. Then she was worried that I already knew some of the original book because of the other character's viewpoints in the follow-up. But it was all good. 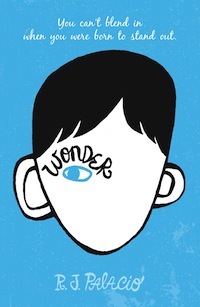 I read Wonder by R.J. Palacio as the 12th category on the PopSugar Reading Challenge (which is interesting, since it's also the 12th book I finished so far this year). The category I read this for was 'a bestseller from a genre you don't normally read.' And on the Amazon site, I see that it's also being made into a movie - and you should know by now how I love when that happens! Wonder is about August Pullman, a boy with facial deformities who is attending public school for the first time as a fifth grader. Up until fifth grade, he's been homeschooled, mainly because his extensive surgeries would have required him to miss a lot of school. The book is about Auggie's fifth grade year at Beecher Prep and his relationships and interactions with the other students, many of whom have known each other for their whole school careers. Having listened to Auggie & Me: Three Wonder Stories first did color a bit of my interpretation when reading the book, as I got to know other characters before Auggie. I don't think the change in my interpretation changed the overall message of the book at all though. This is one of those books that all school kids should read in this generation. It is recommended for readers in 3rd - 7th grade (ages 8-12). It has also brought to mind some books that were universally read when I was growing up, which is kind of fun. If you haven't read Wonder yet, you should totally check it out. And then maybe even see the movie! I have heard of this book but not read it. Sounds interesting :) thanks for the review! Is the movie called Wonder also? This sounds like a perfect read for my ten year old. We've been obsessed with Anne on Netflix.